Swords & Soldiers – Switch Gameplay Footage! Swap This! arrives with special discount on the Nintendo Switch eShop! 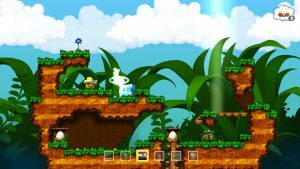 Two Tribes Release Switch Launch Trailer For Toki Tori! Toki Tori hatching March 30th on Nintendo Switch; includes a 10% launch discount! Two Tribes’ classic egg-collecting puzzle game Toki Tori comes to Nintendo Switch™ on March 30th for just 4.99 $/€, with a 10% launch discount. Pre-orders start today in the Nintendo Switch eShop! Toki Tori 2+ stomps onto the Switch eShop February 23rd! Toki Tori 2 returns to its roots after originally coming out on Wii U back in 2013. On Nintendo Switch™ you can play it on the go for the very first time. The Nintendo Switch Edition is the game’s best version yet! For this version, we’ve applied a ton of extra polish, even throwing in some new secrets and solutions. RIVE will have a 15% introductory discount for the first 2 weeks after release! RIVE: Ultimate Edition explodes Nov 17th onto Nintendo Switch! Two Tribes’ metal wrecking, robot hacking shooter RIVE will be better than ever on Nintendo Switch. The game’s been well-reviewed on Steam, with a 94% user score. The recent Limited Run Games physical disc for PS4 sold out in a whim. For more information, follow us on Twitter or on Facebook, or visit rivethegame.com.